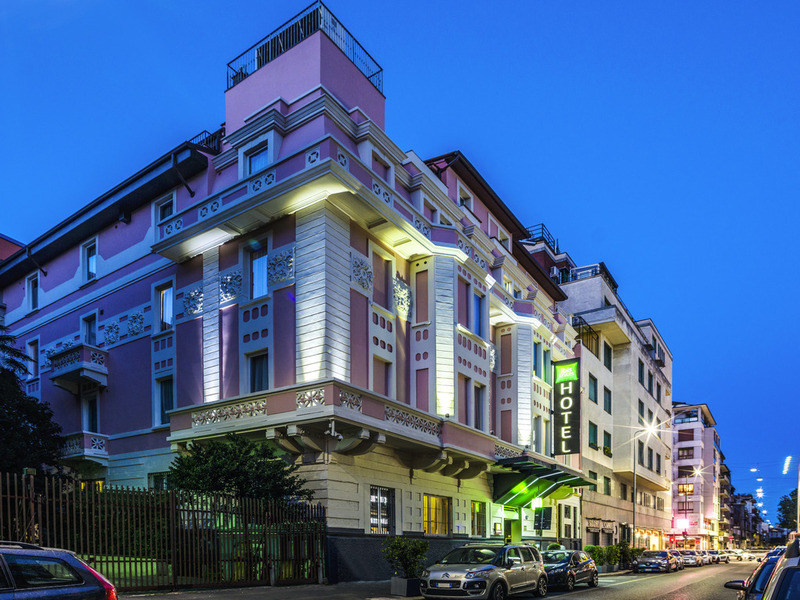 The ibis Styles Milano Centro hotel is on the corner of Corso Buenos Aires, just 328 yds. (300 m) from Lima subway station. The hotel is a historical building that dates back to the early 1900s, has 56 rooms and offers a high level of service. We are in an ideal location in the heart of the city's exclusive shopping area for those visiting to discover this European hub. Right in the center of Milan, this charming economy hotel offers comfort, peace of mind and excellent value for money. If the purpose of your visit is to stroll through the shopping streets of this European metropolis, then the ibis Styles Milano Centro is definitely the perfect destination, located right in the heart of the city's exclusive shopping area. Inviting, modern and comfortable, with a cozy bed and functional bathroom, our rooms have everything you need for an enjoyable stay. The rooms offer select decor with high-quality bedding and curtains and fresh, white linen. They are also equipped with air conditioning and heating operated by a central thermostat. Price/quality very expensive for what you get. Price/quality very expensive for what you get. Storage for the lugage was open and accessible, might suggest to have Some lockers or a locked locker room in place. The hotel was convenient to the metro stop, central train station, and a number of places to eat. The young lady working the front desk was extremely friendly and helpful. Very average hotel. Employee at the reception are far away from heartiest idea, as well as during breakfast. Got an upgrade, but room is on ground floor, with stairs up where we can find 2 extra beds and we were just 2 and needed normal room. When I came back to reception, receptionist start to explain me about LCAH & that it is a gift and I’m unhappy with this. Breakfast is tooooo poor. Very good cleaning of the room. Hotel was modern and clean, room was comfortable, staff was helpful, good location. I normally stay at the Ibis Milano Centre but decided to give this hotel a try this time. I am not going to make this mistake again next time. Even though the price was roughly the same, this Ibis Style is so outdated compared to its sister property that it really felt like a rip-off in comparison. these are the main things that bothered me: - power plugs: while the other Ibis offers a big adapter that fits both regular Italian plugs and Schuko-type plugs, the power plugs in this hotel only work with the former type, making it impossible for me to charge my laptop (silly of me to think I would not need a plug adapter in my own country) - Narrow corridor to the rooms with balcony door always left open during the day letting cold air inside. - Old keys with bulky keychain that have to be left at the reception all the time. - Lots of noise from the street below, windows should have better noise insulation. - Broken thermostat: ironic, considering the brochure in the room advertised the ability to regulate the temperature in the room as one of its &quot;perks&quot; Overall, this hotel did not feel particularly welcoming and I won't be staying here again. Great breakfast and coffee, clean rooms and very helpful staff, thank you. Very good location, next to metro Lima. Very kind reception service. Bigger room that I imagined. It was largely comfortable, everything worked, far too many light switches that don't work, maybe you're building for the future, lighting was good in the room and the elevator worked. Like I mentioned very thin walls, could easily hear people in halls and other rooms. The staff memorized my room number and had a key ready for me whenever I entered the hotel. Lobby area nice and large. Good value. Overall stay was ok 8/10 . Except i didnt get benifits as accor gold memeber for early check in i wait till 2 pm to get free room ready, and no free upgrade available as i always get while gold memeber at accor. Wifi Internet didn't work all time in proper way. Overall, we had a great stay here! It initially took a little while for the lady at reception to warm to us but that wasn’t an issue after. The location is probably one of the best things about this hotel. As soon as you step out you are right in the strip with all the shops! It’s also SO easy to get to the Metro and visit places such as the cathedral. The rooms are quite small but that wasn’t really an issue. I would say that the showers could do with being a little bigger. Without fail, we would walk in to our room after a day out to fresh towels and bed sheets which was nice and everything was working! Also, the guy who made coffee every morning during breakfast hours was lovely! all fine. the first room we were offered was in the ground floor, the lady at the reception changed the room after our request into the first floor. we booked on saturday with the carte bienvenue rate (non refundable). Unfortunately on monday when we checked the rates in the evening, the public rate was much cheaper as the rate which we have booked. That was a bit dissapointing. The staff were very helpfulo with all requests. Very cosy and clean an quiet. I felt that the room was very nice and the hotel personell were also great. The only thing i did not find worth €15 was the breakfast. I had hoped there would be a wider selection.